People love soda. On average, Americans drink about 1.5 cans per day. It doesn’t matter if you’re on a diet or not, one of the most popular ways to satisfy a sweet tooth is with a cold, refreshing soda. 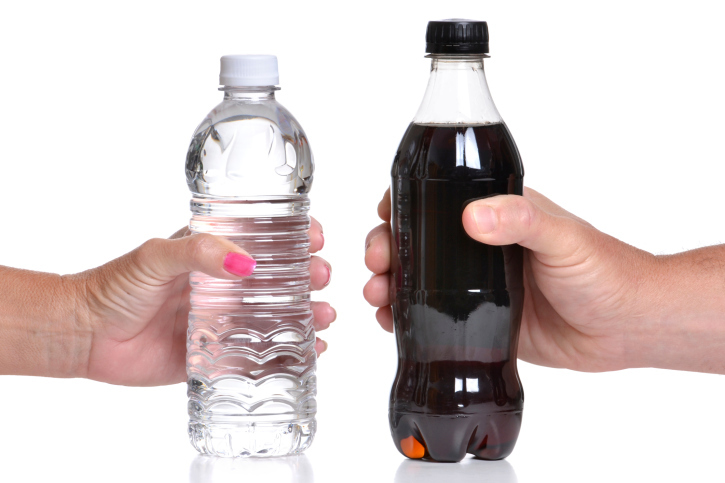 Diet colas and sodas have long been considered a healthy alternative when trying to shed a few extra pounds. After all, diet sodas typically contain zero calories because the sugars are eliminated and replaced with no-calorie sweeteners. The problem, however, is that diet soda drinkers tend to experience accelerated weight gain, boosting their risk for both metabolic syndrome and diabetes. Now, what in the what now? That’s a fair question. After all, how could a zero-calorie diet drink be seemingly worse for you than the sugar-packed alternatives? The main issue is that it causes people to make up for those lost calories elsewhere. They’ll say to themselves, “Okay, I’m having a diet soda with my Big Mac combo so I might as well get a large.” It sounds crazy, but the research backs it up. Going diet can also lead to increased cravings for sugary foods and the illusion that your diet is improving, when in fact it’s essentially remaining the same or getting worse. So if you’re trying to lose weight and one of the keys to your plan is to switch from regular to diet soda, I’ve got news for you: it’s not going to work. A new study from Johns Hopkins Bloomberg School of Public Health echoes the results of previous studies: that diet soda drinkers increase their risk for a number of health issues by thinking they’re making a smart choice. The study found that diet soda drinkers don’t make any other changes to their diet and that obese or overweight people are more than twice as likely to drink diet soda than adults at a healthy weight. This clearly indicates that soda only plays a small role in a person’s overall diet. The San Antonio Heart Study also showed diet soda drinkers tend to be worse off than those who elect the sugary options. It found that people who drank at least 21 cans of diet soda per week were twice as likely to become overweight and obese as people that didn’t. And another study shows that drinking a diet soda every day is associated with a 36% increased chance of suffering metabolic syndrome and a 67% increased risk of acquiring type 2 diabetes. When you consider some of the known issues with the sweeteners used in diet colas—how they affect insulin response and make people crave additional sweets—and the likelihood that they can cause tooth decay, osteoporosis, and weight gain, these are clearly not “healthy” alternatives. If you’re trying to shed weight, the best way to do it is to cut soda of any form from your diet. Water is the best hydrator and weightloss drink available, so try substituting your daily soda for it. Doing so will improve your health in a number of ways. Strawbridge, H., “Artificial Sweeteners: Sugar-Free, But At What Cost?” Harvard Health Blog web site, July 16, 2012; http://www.health.harvard.edu/blog/artificial-sweeteners-sugar-free-but-at-what-cost-201207165030, last accessed January 28, 2014. “Diet Drinks Weight Effects: Choosing Diet Pop Could Ruin Your Diet,” Huffington Post web site, January 17, 2014; http://www.huffingtonpost.ca/2014/01/17/diet-drinks-weight_n_4617462.html, last accessed January 28, 2014. Dahl, M., “Drinking Diet Soda Just Makes You Eat More,” Today web site, January 16, 2014; http://www.today.com/health/diet-soda-probably-not-going-help-you-lose-weight-2D11940230, last accessed January 28, 2014.